US: The US market, long dominated by GE Energy's workhorse 1.5MW turbine, has seen average nameplate capacity inch upwards from 1.60MW in 2006 to 1.74MW in 2009, according to new figures from the Lawrence Berkeley National Laboratory (LBNL). But now, as GE and other manufacturers offer more and bigger choices, the US appears ready to turn a corner and head down a multi-megawatt trail similar to the one blazed in Europe. That the US has been slower to embrace the trend has two main causes - better wind and GE market share, according to Ryan Wiser, staff scientist with LBNL's electricity markets and policy group. "Generally speaking, more robust wind resources are associated with somewhat smaller machines," Wiser says. "And, of course, our market is just fundamentally dominated by GE. So whatever GE is selling, we're going to have a tendency towards those machines. If it's only 1.5MW, that's what we get." None of GE's new 2.5MW turbines are yet installed in the US but major change is on the way. Last December, GE announced a $1.4 billion deal to build 338 2.5MW machines at Shepherds Flat, a massive 845MW Oregon project, with construction expected during 2011 and 2012. "GE has seen upscaling continue in Europe and, presumably, that means there's going to be a trend towards upscaling in the US as well, whether it's now or in a couple years' time," Wiser says. "If GE continues to market a 1.5MW machine, which at some point in the future will be viewed as outdated - not yet by any means - then they'll need to be ready for the next play. The next play is almost assuredly going to be larger machines, so they needed to have something on offer." Last year 1,841 turbines that were 2MW or larger went online in the US, representing 4.15GW, or 44% of the 9.5GW total. That growth was a jump from 2008, when 1,347 units at 2MW or larger went online, comprising 3GW, or 34% of the year's 8.8GW overall tally. US 2MW and above turbines are currently Vestas (3MW), Clipper (2.5MW), Nordex (2.5MW), Fuhrlander (2.5MW), Mitsubishi (2.4MW), Siemens (2.3M) Suzlon (2.1MW), Repower (2MW) and Gamesa (2MW). At present, though, few of the larger machines are manufactured in the US and there is much more to the game than picking items off a multi-megawatt menu and calling a project developed. As the move to bigger turbines continues, the US industry will be challenged by many factors - including transportation, transmission, supply chain, manufacturing capabilities, crane availability, wind resources and even political posturing. The industry is scrambling to get ready. The optimal solution would be multi-megawatt machines manufactured near windy sites using only US-made parts in an effort to mitigate transportation problems and create high-paying jobs. But that ideal set of circumstances will only become a serious possibility in the distant future. For starters, few US foundries are currently capable of producing the necessary oversized components. According to Ralf Sigrist, CEO of Nordex USA, only one US foundry can pour the large castings and forged parts required, although a former Ford factory in Michigan is being considered for retrofit as another. "You could say that in the past 50 years, most of that machining and pouring - foundry capacity - closed down in the US and went either to China, the Far East or Mexico," Sigrist says. Much the same is true of gearboxes and generators, most of which come from overseas. "Today, there is only one gearbox manufacturer in the US, or in North America, that can technically do those large gearboxes," Sigrist says. "We are currently not aware of even a single generator manufacturer that could supply the generators for the large turbines in North America." Those specific needs are likely to be met by Chinese and European factories, as Nordex prepares to open its Arkansas factory in September and begin producing 300 nacelles a year for its 2.5MW turbines - with the potential to double capacity by running a second shift. A European leader, Nordex recently returned to the US after a brief stint in the late 1990s that resulted in the installation of fewer than 50 imported 1.3MW machines. Last year, upon return, 2.5MW machines were imported from Germany for a 60MW Pennsylvania project and two more projects involving German-made machines are possible this year. Nordex already gets blades and towers from US facilities, while a supply chain is under development for feeding the Arkansas factory. Much will come from foreign shores. "But we work with some of the European suppliers that already have operations in the US and also have assembly here," Sigrist says. "And we work with some purely US suppliers that come from other areas, like the automotive sector." Still, Sigrist counsels against assuming automotive experience will transfer effortlessly to the wind business, because the industries define longevity differently. "If you run your car without interruptions for 18-24 months, then it's done," Sigrist says. "Whereas a wind turbine, and the components that you put in a wind turbine, are not only bigger and heavier but they also have to have a design lifetime of at least 20 years." He also cautions against the "buy American" policies embraced by Democratic US Senator Charles Schumer and others - a complicated stance that Sigrist says could create unintended consequences and keep foreign companies from investing in US expansion. "But we are not afraid of the 'buy American' clause, because already today our US scope is pretty substantial - in excess of 50%," Sigrist says. "And, with our assembly and manufacturing in Arkansas, we will, from the beginning of 2011, have a US local content in the order of 70% to 80% on turbines delivered and installed." Overall, the three-year re-entry process has given Nordex insight into the US market regarding different ways of getting equipment into the country and off to a site. One easily overlooked factor is exchange-rate fluctuation, which can make importation a dicey prospect even before shipping costs are added. "The main reason why you have to have your local manufacturing on this continent is the exchange rate," Sigrist says. "Heavy exchange-rate fluctuations can sometimes make you go from competitive to uncompetitive." So although Nordex might be able to get turbines more cheaply to a site in the eastern US by shipping them from Germany rather than trucking them from Arkansas, Sigrist says the company is unlikely to import machines once the Arkansas factory is finished. "You have to have a planning certainty," he says. "You might save $20,000 or $30,000 per turbine on the transport, but the exchange rate can easily take away $200,000." In the end, he believes that costs will usually end up driving overall decisions. "The customer will look at the project and what produces the best economics - what has the best efficiency and allows for the best return," he says. "And, for the larger turbines, you can generate the same or more energy with fewer foundations, with less access roads, less crane paths and less infrastructure because you need fewer turbines on a site than from the smaller ones." Those factors are also important for utilities, like Portland General Electric (PGE), which are increasingly responsible for green-energy quotas set by state-mandated renewable energy standard (RES) requirements. PGE, Oregon's biggest utility, owns Biglow Canyon, a 450MW three-phase project in the state's Columbia River Gorge. 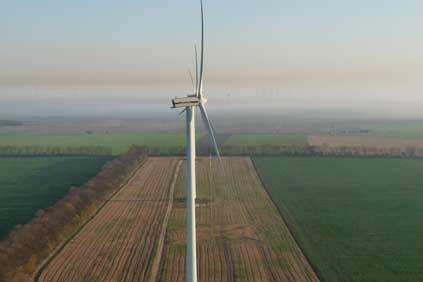 Phase three, expected to be completed this year, and 2007's second phase, comprise 141 Siemens 2.3MW turbines. "If we go with the smaller turbines, we can maybe get 300MW on a particular project site," says Kelley Marold, PGE wind development director. "If we go with larger turbines, we can keep the cost of energy low and very comparable, and we can get more megawatts on the site. That enables us to take a bigger step towards meeting our RES goals." Another area for consideration is transmission interconnection. "The more megawatts you can install at a particular site, the more cost-effective the interconnection can be and the less you rely on having to have other projects come forward and be willing to share in those interconnection costs," Marold says. Further, bigger turbines usually need bigger cranes, especially with the taller towers that are increasingly being used. That can pose problems in the US, which is notoriously lagging behind Europe in crane advancements. "One of the primary considerations is how big are those tower sections and how much do they weigh?" Marold says. "As you go up in tower height, you have to make sure you have the cranes that can not only go that high, but can lift the very heavy nacelles that much higher." Nearly 1,500 Siemens 2.3MW turbines are installed in North America, according to Mike Revak, the company's vice-president of US sales. "One of the big pushes for Siemens is to have a presence in the Americas," he says. "By the end of this year, we'll probably have about 1,500 people that provide wind turbine support in a number of roles." Kansas, with its prime middle-America location, will be home to the company's new plant for large turbines when doors open on its 2.3MW factory, which will eventually produce 650 annual units. "We'll ship the first nacelle in December," Revak says. "Then we'll ramp up through 2011 and be in full production in 2012." Siemens, which acquired the Danish firm Bonus Energy in 2004, currently produces its nacelles in Denmark, but much of the rest of its equipment is US made. "We've gone from almost 100% Danish to about 55-60% US dollars right now, when you look at the overall value of a turbine and our scope of supply." The company sees transportation as a significant issue when it comes to containing overall costs. "If you look at a standard 80-metre tower, you're talking about shipping three tower sections that weigh a lot," Revak says. "Then there's three blades, the nacelle and some other components. We've done a lot of work on getting the transportation costs down. We've made a huge investment from the standpoint of rail." The company recently invested $10 million to add a rail yard at its blade factory in Fort Madison, Iowa. "We also did a number of projects in 2009 where there were railroad-transported nacelles," Revak says. "The things we're doing relative to the solutions of rail, and adapting the tooling and the product to be able to do that, have really driven the transportation costs down for the machines. But it still is a very large part of the project." In general, Revak believes that 3MW is the upper edge of the sweet spot for onshore turbines, although he expects offshore machines to keep getting bigger - and notes for example, the Siemens 3.6MW turbine. "You can build bigger machines offshore," he says. "You don't have the constraints of roads and bridges and tunnels." One company that doesn't need to be convinced of offshore potential is Clipper Windpower. The California-based manufacturer moved closer to realizing its 10MW machine, called Britannia, by breaking ground in February for a UK blade factory. The company expects a 72-metre blade prototype by late 2012. Meanwhile, Clipper has installed roughly 500 of its flagship 2.5MW Liberty turbines in the US and Mexico since 2007. The machine's design was born in 2001, when average turbine sizes were still around 900kW, according to company founder Jim Dehlsen. Clipper won a grant from the US Department of Energy in 2002 and its breakthrough came with the development of a distributed drive train, made possible because the Liberty uses four generators instead of the traditional one. That design allows the 2.5MW turbine to carry the same weight as a typical 1.5MW machine. "The fact that you're splitting the load path much more than in a conventional gearbox allows you to scale up and have the power-to-weight ratio remain constant," Dehlsen says. "With a conventional gearbox, the challenge that you have is that the weight goes up exponentially as you start moving beyond 1.5MW." Clipper is also developing an onshore turbine in the 5MW range - the ambitious company's idea of a mid-sized machine. "It's the sort of thing where we'll have to look at where the market's going to be, say, in 2015 or 2014," Dehlsen says. "I think there will be acceptance for that scale of machine at that point." LBNL's Ryan Wiser also expects the trend towards bigger turbines to continue. "With every new design, with every new plateau, there have been claims that turbines are not going to get any bigger or that the next size will be the biggest and then we'll hit the limit," he says. "But we haven't hit the limit yet. So I'm loath to say we're going to hit it with our next size threshold." The key question is, do bigger turbines result in cheaper electricity? "We believe that to be true," says Siemens' Revak. "We believe that going bigger, in terms of megawatts and in terms of the energy capture, will lead to, and does lead to, reduced costs. And I think if you looked at it over history, every four or five years you'd see a new generation of larger turbines and larger rotor diameters - and the cost of the energy reduced over time."